So declares a resolute Vice President Mike Pence. It probably comes as news to most people that the US wasn’t sending relief to Christian and Yazidi survivors of genocide these past many years they’ve been so endangered. Especially since a lot of money was directed to aid persecuted minorities during President Obama’s administration, which continued through the first year of President Trump’s. Where did it go? Leading human rights expert Nina Shea has taken every opportunity possible to tell that story, enfolded within the greater narrative of the unfolding disaster in the Middle East. Since fiscal 2014, the U.S. has provided $1.4 billion in humanitarian aid for Iraq, but very little of it has reached the beleaguered Christian and Yazidi communities. This is because the Obama administration decided to channel most of it through United Nations refugee and development agencies, a practice the new administration has continued. There is no protection for religious minorities in the U.N.’s overwhelmingly Muslim camps, and Christians and Yazidis are terrified of entering them. The U.N. doesn’t operate camps in Iraq for displaced Christians, and the international body has enough resources to shelter only half the Yazidis who congregate around Dohuk, in Iraqi Kurdistan. U.N. programs also exclude the local churches that struggle to care for these minorities, forcing them to raise aid on a piecemeal and insecure basis from other sources. Far lower percentages of Christians and Yazidis are returning from displacement to their homes in the devastated Nineveh Plains and Sinjar, respectively, compared with the larger religious groups in Tikrit, Fallujah and Mosul. The prior (Obama) administration decided to have U.S. reconstruction assistance, now at $265 million since fiscal 2015, also flow through the U.N. The director of the U.S. Agency for International Development, Mark Green, started only last month and has not yet moved to change this policy. USAID lacks direct oversight in Nineveh and relies heavily on U.N. Development Program reports that claim progress in Christian towns. One local church authority told me the U.N. reports “grossly overstate the quality and substance of the actual work” and their projects’ influence is “minimal or nonexistent.” A representative from the Nineveh Reconstruction Committee, a unified church group, told me earlier this month that the only major projects under way are its own. These are supported by Hungary and the Knights of Columbus. Samaritan’s Purse and Aid to the Church in Need are planning projects in Qaraqosh, also without U.S. government assistance. These private charities can rebuild houses, but large infrastructure projects need government aid. The U.N. acknowledges that most of the displaced minorities have not returned home and have shown “a reluctance to return without guarantees of their security and the stability of their towns and villages.” Church leaders close to the displaced are excluded from U.N. and Iraqi government committees that decide stabilization projects, track progress and ensure locals are hired for them. And yet, administrative foot-dragging continued. The Knights of Columbus, a global Catholic charity helping with the housing, feeding, and medical care of thousands of Yazidis and Christians, has stated that a much larger rebuilding plan is needed to save them from extinction in Iraq. Stephen Rasche, general counsel of the Archdiocese of Erbil, Iraq, applauded the State Department’s assistance to the Rohingya community in Burma. However, he and other Catholic leaders remain “deeply concerned” that the U.S. government has still directed “little or no aid” to the Christian community in Iraq despite its clear declaration that ISIS committed genocide against Christians. Then Congress intervened, especially four key members of the House of Representatives. 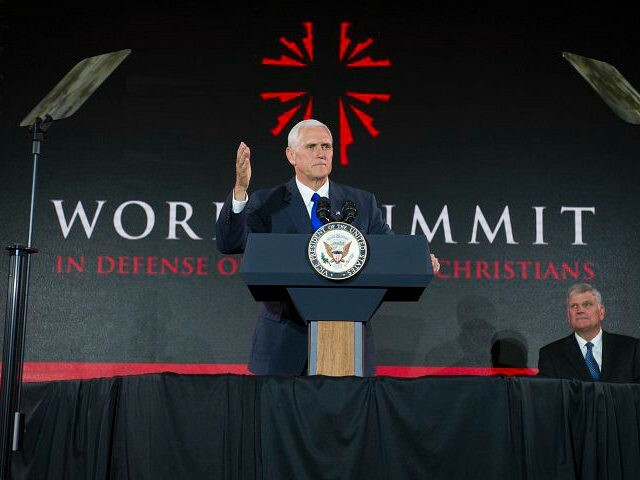 That came just days before In Defense of Christians‘ annual Summit in Washington D.C., featuring dozens of international human rights leaders, clergy, members of government, and Vice President Mike Pence representing the Trump administration. Some Christian media called it a “bombshell”. The Atlantic report it, in grand understatement, as a shift. The ‘international religious freedom as national security issue’ message is one experts have been emphasizing for years. In his address, Pence signaled that the administration got the message. Since the president took office, he has been promising to eradicate terrorism and eliminate the “beachhead of intolerance” created by radicalism. What was different here is that Pence promised a policy shift to accompany the rhetoric: Based on claims that the United Nations often denies funding requests from faith-based organizations and provides only “ineffective relief efforts,” the administration will now “provide support directly” through USAID. The author attempts to diminish the importance of the shift in funds late in the piece, calling it “misleading”, but it is she who is misled. Yes, the money will go to private NGOs on the ground doing the person to person relief work. But they are the best groups, like the Knights of Columbus, Aid to the Church in Need, and others which apply the full funding to the intended recipients and take no portion for their own costs. They are professionals, they know the people and the specific needs, and apply their full resources to addressing them. Tis the season to protest in America. The president and sports celebrities take it too far. How this all started and how it escalated is less important than the weekend blowup that engulfed America, when average folks count on taking a break from tensions of the week at work and in the news and enjoy the diversion of sports events. Now it’s all blurring together and social tensions have invaded the sporting arena. Sports have become more political for a long while now, but this is that on steroids (which is another story altogether). The case of Donald Trump vs. the players of the National Football League is emblematic of our political moment: At its heart is a very serious issue, but that issue is wrapped in so many layers of celebrity, stupidity, opportunism, social-media hysteria, and crassness that it is nearly forgotten. One very serious issue is how indivisible we really are, and how we use the freedom we have. But overarching that two-part concern is the thick-as-blood honor we pay to those who have fought for generations, paid a great price or the ultimate sacrifice, to preserve the rights and freedoms of the United States. And the flag and National Anthem represent that. The flag drapes the coffins of Members of the Military Services killed in action, it flies at half staff in memory of those who gave their lives in service, it famously was captured in an iconic photo as it was being raised at Iwo Jima by six Marines in World War II. Which turned into the Marine Corps War Memorial in Washington DC. Most Americans probably don’t know how the National Anthem even came to be the opening of major sporting events. In fact, as a Chicagoan, I didn’t even know the Chicago Cubs were part of that history. It’s edifying to see a nation united in that respect for its shared history, rough as some of it had been. Rough as it is now. This fad may have petered out naturally after a few more months; Trump’s all but guaranteed that we’ll get it through the 2020 election. After the weekend of ‘national anthem protests’ across the nation and the National Football League, everyone was wondering how the nationally beloved Monday Night Football game would handle it. It was pretty amazing to see, when it played out. Just before the National Anthem, a gigantic American flag was unfurled from one side of the football field to the other, cover the whole playing field. Kind of hard to protest that. And the players and owners didn’t want to, after all. 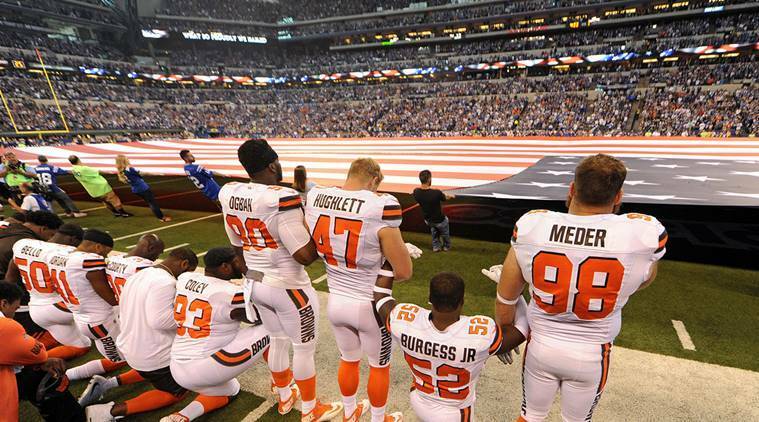 “I made my mind up on this issue,” (Dallas Cowboys Owner and General Manager) Jerry Jones said…”that I wasn’t going to comment other than I am very proud of the fact that the Dallas Cowboys and our players have always stood for the flag and the recognition for the flag always. What is important is to figure out that to show the kind of respect and the perception of respect. How can (the team) in front of a national audience show unity and a statement of equality. (The team) wanted to do that. It evolved throughout the organization, particularly over the last two days, and it was executed. Of course athletes have the right to protest. Their employers also have the right to set standards of professional conduct, and football fans have the right to change the channel. The president has the right to tweet. This is not a question of rights but a question of judgment, which was, unhappily, in short supply over the weekend. Let’s get back to the business at hand. The president needs to work on national issues and geopolitical affairs and North Korea especially. Celebrity athletes need to play sports to the best of their abilities. And the rest of us have our assorted family and work obligations to fulfill, and community and charitable needs to address, especially in the ongoing need for relief in disaster struck areas hit by back to back hurricanes and earthquakes. It’s humbling – or should be – that for people who survived such devastation, who are subsisting on absolute basics, having lost most of what they had with little to sustain them until substantial relief arrives and relief workers help to rebuild their lives, homes and communities, the American flag on the arm patch of the Coast Guard or Army Corps of Engineers, on the helicopters and trucks delivering supplies and flagpoles left standing after the storms, represents hope. It’s up to the American people to deliver on that. Nature keeps sending disasters. People keep sending relief. We’re still learning the extent of the damage Hurricane Irma did to the homes, neighborhoods, communities and fundamentally the people of the state of Florida from the Keys to Jacksonville in the north, with access to some areas cut off for days, and therefore, delivery routes of relief. Irma devastated Barbuda. Now, Hurricane Maria threatens destruction in Puerto Rico. The Category 5 storm with sustained winds of 175 mph (281 kph) will smash into the Virgin Islands Tuesday night. It has already obliterated parts of Dominica and killed at least one person in Guadeloupe. Puerto Rico sheltered many of the evacuees who fled from other Caribbean Islands during Hurricane Irma earlier this month. Now those evacuees and native Puerto Ricans are bracing for devastation. That has been the focus for weeks now of people across the United States. When Hurricane Harvey was still beating down on Houston, whatever had been dividing Americans politically or culturally dissolved or got sidelined by the force of nature and the ‘force more powerful‘ than destruction, love and charity impulsively and instinctively passing from person to person. Numbers of people beyond counting have been showing up in this ‘army of compassion’ descending on sites of destruction even while they’re still being battered. Especially then, which shows the real magnanimity of regular Americans. 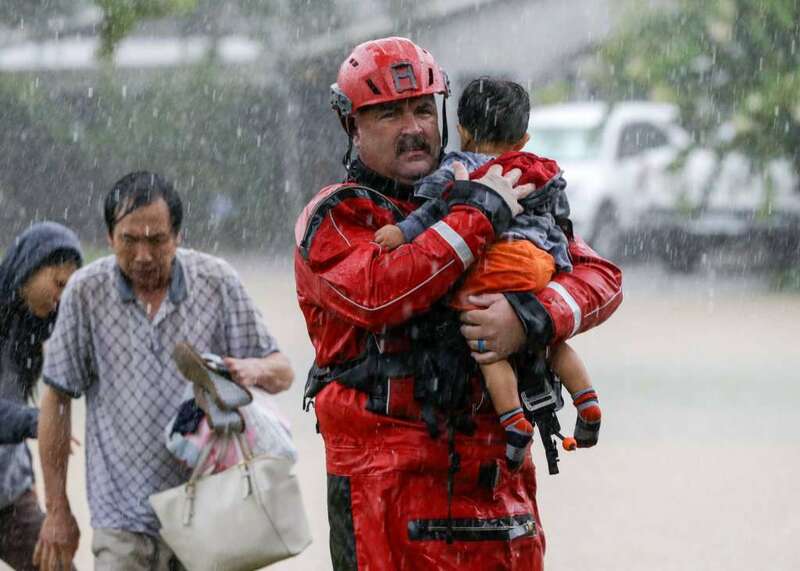 Houston’s ‘Mattress Mack‘ is emblematic of this spirit of unity and generosity, and the humility that, to a person, seems to define the motivating impulse driving people from their comfort zones to the place they’d rather be in an emergency: with the people under siege. They have offered what they have to those who need anything. Magdalena Marez, 27, and her fiancé Zachary Gasser, moved into their apartment a few months ago. They went furniture shopping at a handful of Houston-area stores, but they’d never stepped foot into a Gallery Furniture store until early Tuesday morning. They wandered in, soaking wet, just after evacuating from their apartment. 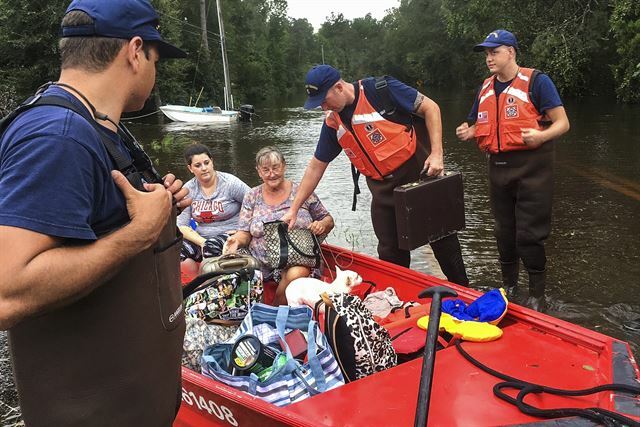 Floodwaters were ankle deep, and they struggled to make the drive. When they arrived at the showroom volunteers handed them dry clothes, toothbrushes, soap, shoes — and a mattress still covered in plastic. Marez is moved by McIngvale’s generosity. McIngvale is also paying for portable showers so evacuees can have their first hot shower in days. Marchione, the employee, says his boss has opened the store to evacuees and is providing meals because it’s his way of giving back to a community that has brought him success over the past 36 years. Jim McIngvale was my guest on radio, because he answered my call with the generosity he shows to all calls on his time and attention. Media had descended on ‘Mattress Mack’, he agreed to brief exchanges with them while working, mainly to put the word out that all help for evacuees was needed and welcomed. He told me that a reporter for some big media outlet asked why he was doing all this work in his big company store, housing and feeding so many people. He said “because I have to”, but the reporter replied “no you don’t”. He quickly corrected “yes I do”. It’s what he knows, it’s what he lives. His Gallery Furniture business is still helping, in the cleanup phase and beyond. The Miami Herald editors published a fervent wish for such charitable goodwill for Floridians before Irma hit: “Be kind, send help, rebuild“. Nerves are frayed, to say the very least. But South Floridians have always risen to the occasion during difficult times, extending a generous helping hand, with no hesitation, with no expectations of reciprocation. It is one of the Editorial Board’s most fervent wishes — but only one — that in the pre-disaster hunt for plywood, water, gas, and hotel rooms, we remain civil, empathetic. Remember Connect Miami? April’s successful community-wide initiative to encourage residents to engage with people unlike them? To hear their stories? To find commonality? Irma will be put this initiative on steroids. I’ve had several guests on radio these past two weeks somehow involved in disaster relief and recovery, charitable organizations and government aid, professionals, spiritual directors, people trying to help people and connect with the best ways to get things done. Some of them said something I’ve been thinking, hoping, saying on my show, that we should be able to keep this going. See ‘the other’ as a person to engage, to serve, to share a vulnerable moment with and find ways that encounter can benefit both. And build or rebuild the nation that’s made up of people, known to be fiercely independent, but who are remembering how interdependent we truly are. He told fellow senators, essentially, to get over themselves and get serious. There has been so much manufactured drama in politics and political punditry for so long now, it’s refreshing when events that happen in real time for Americans to witness firsthand are naturally dramatic and actually inspiring. Sen. John McCain’s return to DC from surgery following a brain cancer diagnosis, his appearance coming just in time to cast the pivotal vote on a measure to continue debate on repealing and replacing Obamacare, restored maturity to the floor of the Senate. And much needed gravity. Here’s what he said, in full. Right. Thank you for stating that so starkly and honestly. Each election cycle, general or mid-term, national or local, brings another round of promises to change things that never change. McCain has been in government long enough to know that and see the best and worst of it all. 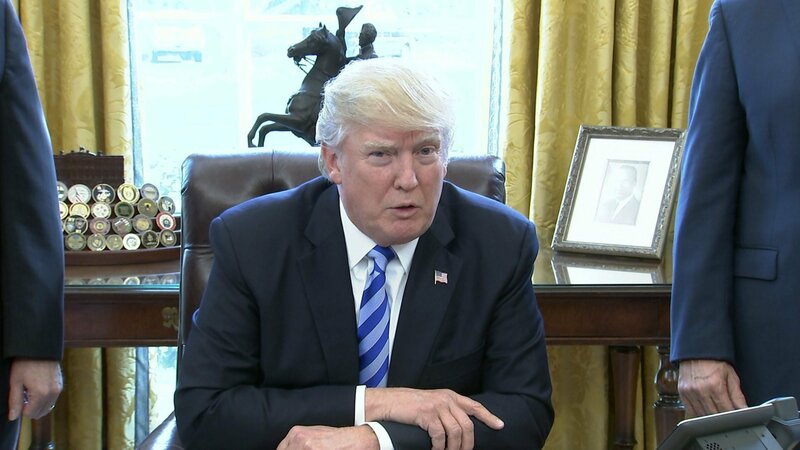 And he delivered a ‘come to Jesus moment’ to his colleagues, a ‘for crying out loud’ plea to return to civility and honor and statesmanship. That was so needed, even though it didn’t seem to make a difference, in the end, since the repeal failed. McCain’s speech was ennobling, it was heard, written into the record, and noted by many people and commentators looking for leadership. Sen. John McCain on Tuesday in the Senate gave one of the great speeches of American history. Its content was an almost perfect distillation of the career-long themes of this remarkable, infuriating, courageous, temperamental, wise, headstrong, indefatigable patriot. McCain has always seemed to operate according to an internal logical consistency whose existence few could doubt but even fewer could fully fathom. The logic’s premises all seem to reside in a five-dimensional Rubik’s Cube, its colored tiles always shifting around, inside McCain’s mind and psyche. But this speech, this raw but contemplative message to colleagues and countrymen, contained the clearest and most accessible exposition of McCainism imaginable. Yes. Focus on statesmanship. This was a ‘civic homily’, says Quin Hillyer. The final passages of McCain’s civic homily came straight from the very soul of a man who, though self-admittedly flawed, has served this nation with a steadfastness and grit beyond most imagining. He served it because, with every fiber of his being, he believes it, believes us, to be morally worthy of selfless service. Yes, we Americans are a blessing to humanity, no matter how many academics and agitators mendaciously say the opposite. And for some 60 adult years of sharp-elbowed, sharp-tongued dedication to what he likes to call “a cause greater than self,” John McCain has been a sometimes cantankerous, more-often captivating, blessing to America – and thus a blessing to a whole world made better by America’s presence in it. And he’s not finished serving — no, not yet. Hopefully, he has inspired many colleagues in the Senate to start.